If you love this free pattern, Add it to your Favorites…Click Here!! 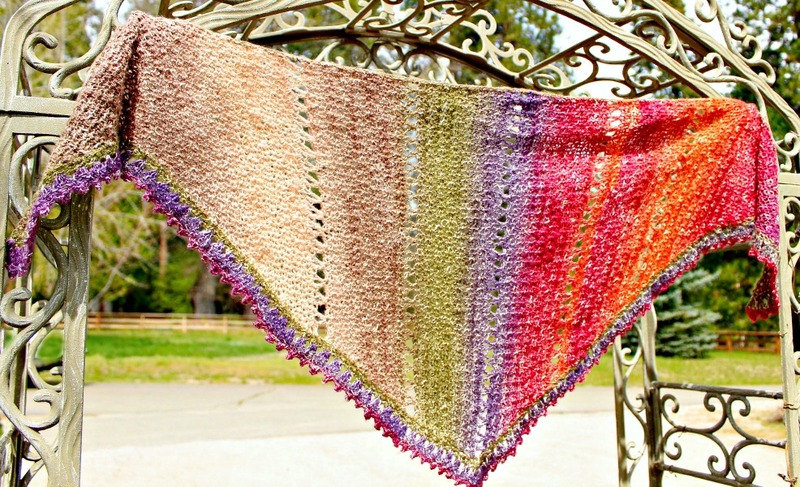 You may be wondering the name of this yarn.... Shawl in a Ball ~ Shown here in Calming Desert!! Because this yarn is a mix of cotton and acrylic,,, It is perfect for Spring and Summer too!! Amazing Grace Simple Spring Wrap is the 16th Free Crochet Pattern in my Amazing Grace Series.... This project only has one simple row of the Amazing Grace Stitching.. Hence ~ Amazing Grace Simple Spring Wrap! 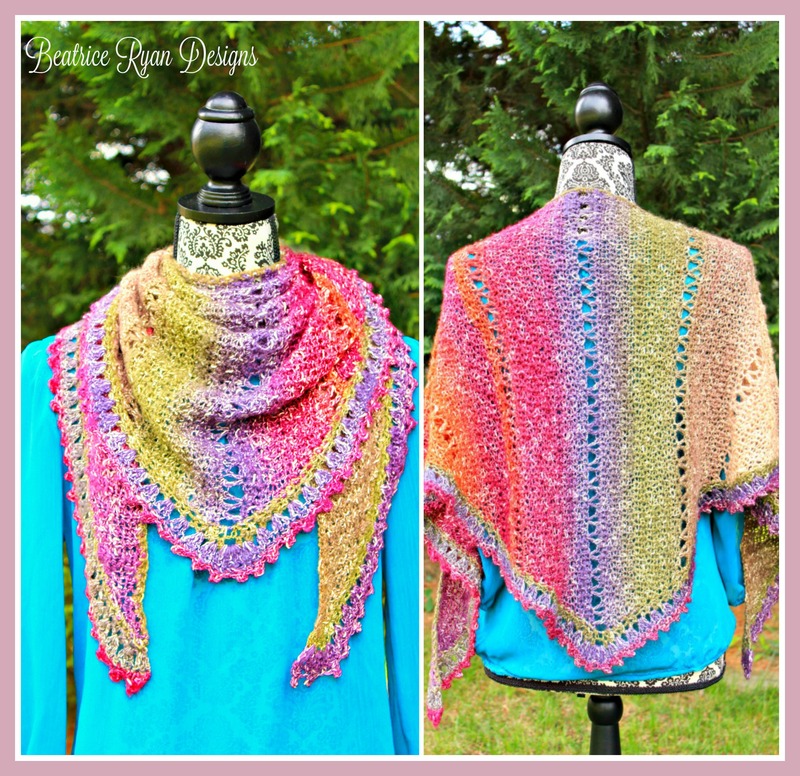 This would be a perfect Prayer Shawl to pass on to someone suffering or recovering from Breast Cancer... Shawl in a Ball comes in many beautiful color schemes and I hope you will make a few and pass them on!! 8 Stitches x 8 Rows of Front Loop/Back Loop Single Crochet = 2" x 2"
The FL/BL stitching gives a subtle texture, if you want to just use Sc,,, Just uses the same stitch count. If using a different yarn, it may take more or less yarn due to the texture of Shawl in a Ball. For * * repeats, I use 1st/next to save text, this simply means on if this is * * is the first st after the ch 1, turn you will go in the 1st st and all other repeats go in the next. Row 165; Ch 1, turn, Dec sc. Row 1: 2 sc in same st as previous stitch in top edge, sc 105 evenly across to the last st before the marker, (2sc, ch2, 2 sc) in the dc st where the marker is, sc 105 evenly across to the top edge, 2 sc in the 1st sc of the top edge, sl st in the same st.
Row 2: Ch 1, turn, sc in the same st, * sk st, (sc,ch1,sc) in next st*, repeat * * 54 times, ch 2, sk ch 2 sp, *(sc,ch1,sc) in next st, sk st* repeat * * 54 times, sc in last st. = 108 (sc,ch1,sc) spaces, 2 sc, 1 ch2 sp. Row 3: Ch 3, turn, 2 dc in same st, *3 dc in next ch 1 sp*, repeat * * 54 times, 6 dc in ch2 space where marker is, repeat * * 54 more times, 3 dc in last st. = 336 dc. Row 4: Ch 1, turn, sc in same st, Picot (ch 3, sc in base of last st), sk st, sc in next st, *sc in next st, picot, sk st, sc in next st*, repeat * * across to end. Steam or wet block your project into shape. Congratulations!!! You have made an Amazing Grace Spring Wrap!!!! As usual,,, Charlie loves to Photobomb the projects!! 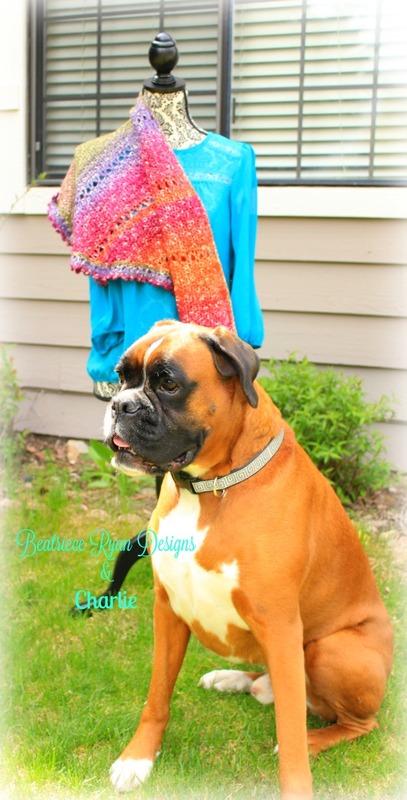 Amazing Grace Lucky Green Shawl… Free Crochet Pattern! Thank you so much for sharing your patterns, and your story. Two of my Aunts have had double mastctomys in the last 18 months and my cuzin and I are both being followed for issues at this time. I have tons of beautiful yarn and plan to make and donate. Hey Susan….Beautiful work! I was wondering if you found this yarn difficult to work with or not? I love the yarn & purchases a skein a few months ago to make my mom a prayer shawl. I’m having a hard time & trying to get it done in time for me take it to her the end of May. It’s probably going to be my last time seeing her in this world & was wanting to give her some comfort. The rate I’m going, it want be even close to being finished! How long did shawl take you to complete & what yarn would you recommend for an elder crocheter that hasn’t crochet since her 20’s? This took me a couple of weeks to complete. The yarn is nice but a bit hard if you have to undo any of the rows… I recommend pulling from the outside of the skein so you don’t get a mess from the inside. I am talking about row74 has 75sc then I row 75 there are 2 flsc but the count remains at 75….that’s an increase so should be 76sc then in row 77 we do the increase on the long straight side of shawl? Just want to be sure…. Thank you so much for your help, I am trying to get this done ASAP for my 90 year old aunt and she’s still an expert crocheter!!!!! Thank you for the beautiful Shawl pattern. Oh dear…. I decided to make it with plain single crochet, and the directions said the stitch count was the same. The shawl base is almost complete, but I am worried there will not be enough Shawl in a Ball left to make the top edge and bottom edge rows. Top edge maybe and the first row on the bottom if I’m lucky, but not the decorative part. Should I be heading back to my local yarn store? It is hard to know for sure… But I did use my entire ball when I made it. I love this pattern but I don’t see a link to print it without all the side bar pictures etc. it would take all of my color ink for sure. And I don’t need the ads, the side bars, etc etc. I like to have a printed copy on my lap to check off as I do each row. Do you have a pdf of this pattern with the one picture at the top? I love your shawl and can’t wait to make it but I can not find the print friendly button! I hope I’m not sounding totally amateurish, but does flsc and blsc mean front loop single crochet and back loop single crochet? Beautiful shawl and thank you! Row 84…how do you dec Flsc? How is it possible that these two rows have the same stitch count? Both have 36 repeats of 2 sts = 72 sts and both have 2 Flsc = 74 and both have an extra Blsc = 75 for both.